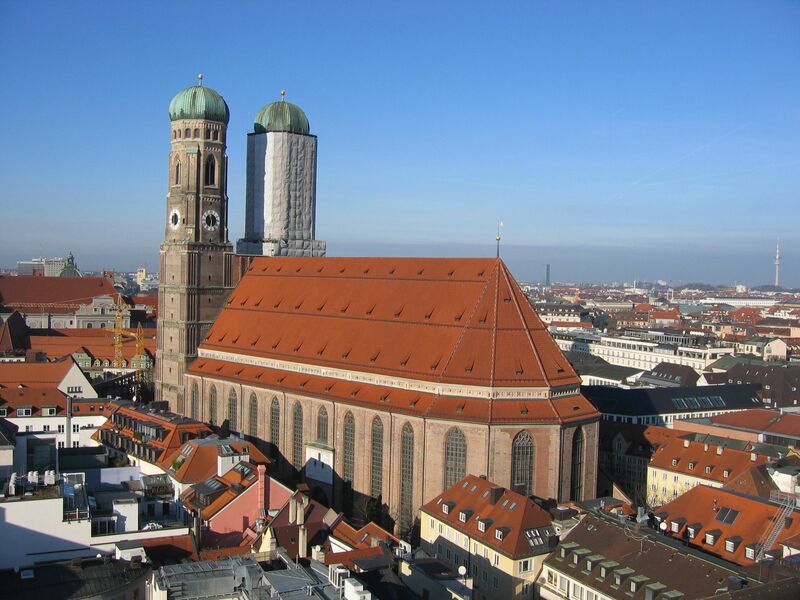 Munich was the launching point for the tour and as the crew started to gather it was off to the Hofbrauhaus for a Bavarian feast. Sausages, pretzels and beer were the order and enjoyed with some traditional Oompah-pah music and a bunch of men wearing lederhosen cracking whips and slapping thighs. Truly a unique experience. The next day we loaded the bus for the first of many times. After a short ride – or almost a little too long for some bladders – we arrived in the Dolomiti and the village of Arabba. Once again we were greeted with open arms by the Evaldo staff. Sunny skies greeted us for most of the week as with our guide, Diego, we re-acquainted ourselves with names like; Pordoi, Marmolada, Campolongo and Vescovo amomg others. The snow was great on-piste but the off-piste slopes were a little bare. Plenty of high speed cruisers were a perfect warm-up for the weeks to come. 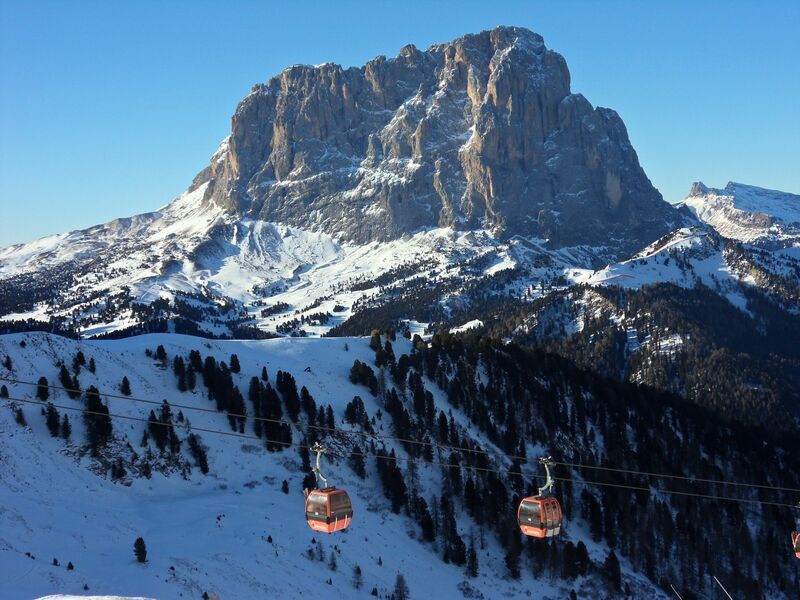 The World Cup downhill run, the Saslong and the Alta Badia GS run were fan favourites as well as the journey around the Sellaronda. The local watering holes – the Igloo, Fodom and Paolo's – saw one or two grappas and bomdardinos enjoyed. 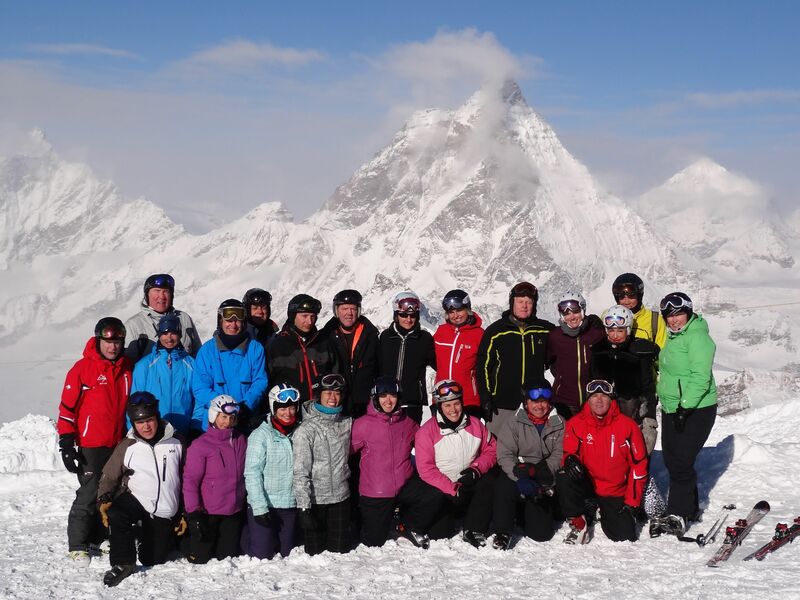 The Yes Crew invaded Corvara one afternoon and took over "The Shed". Even Mario was impressed with our crew's efforts. A new place was also discovered as we took over Diego's pub for some final night karaoke. On the way there we witnessed a vintage car rally. Quite bizarre to see open top old cars racing through the streets of Arabba at night and in the snow. On our final day, we had a new experience in the Dolomiti, snow. As nice as it was to ski some fresh, it would prove to be foreboding for our transfer the next day. With the snow still falling, we boarded the bus for Austria with hopes that the Flexenpass would be open. 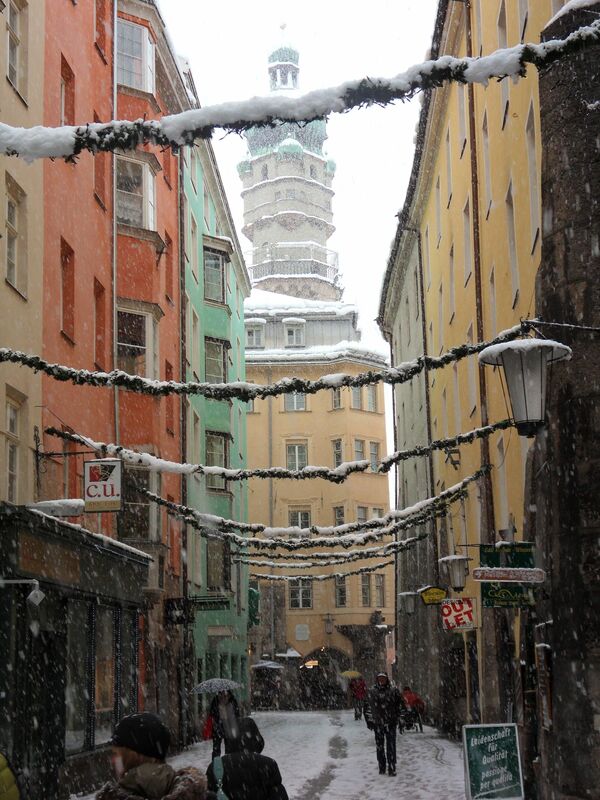 Well hope could not conquer heavy snow and avalanche danger, so we were forced to overnight in Innsbruck. After a night of shopping and exploring the good news was the pass was open the next morning. The Flexenpass was originally built in 1896 and redone in 1949 and as we drove up, we could see why the road had been closed. Huge snowbanks lined the road and the slope came up to the roofs of some of the hotels. After climbing out of the tunnel and over the saddle, we descended on Zurs. After a transfer of 30 hours and 27 minutes, we finally made it to our new home, the Arlberghaus. New snow greeted us as we hit the slopes the next day, a lot of snow. With the snow still falling and the visibility rather Whistler-esque, the groups headed to Lechs and the safety of the tree-line. The skiing was deep. Face shot after face shot as we keep finding pockets of fresh snow. After endless laps of great snow (and heated chairlift seats) the Frozen bar was calling. The morning we met our guides Ziggy and Andrea and they took us to explore areas like; Trittkopt, Muggengrat and Rufikopt. All week we experienced lift serviced heli-skiing as the sun came out and terrain started to open. 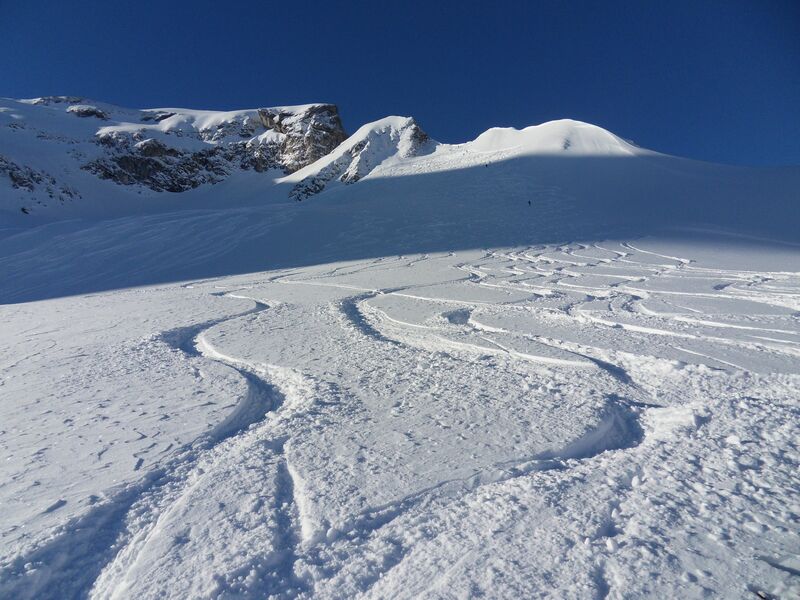 Our guides managed to find all sorts of stashes of fresh snow and the skiing was amazing. Aussie day came with the Kiwi leading the Austrians in a rendition of Waltzing Matilda. 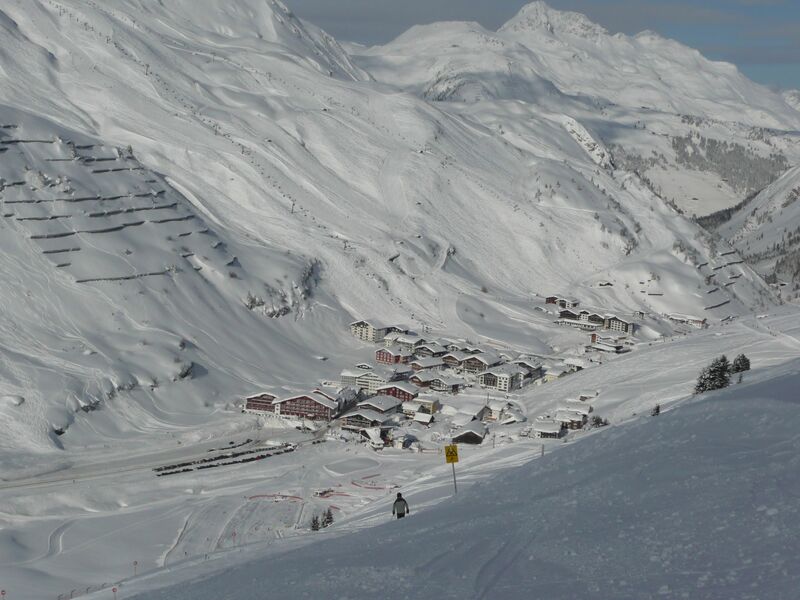 While some explored St. Anton, others skied around the White Ring. The White Ring took us from Zurs, over the Madloch-Joch down to Zug, then up the Kriegerhorn down to Lechs before heading up the Rufikopt and back to Zurs. St. Anton was reached with a short bus ride and the skiing was good. A trip up the Valluga tram and a run down the World Cup Kandahar course were enjoyed before heading to Taps, the Crazy Kangaru and the Mooserwirt for a beverage. Our time in the Arlberg was over much too quickly and will be remembered for two things, Rick/Hannah's skis and some serious amounts of snow. Still shaking the snow out of our ears, we headed for the Glacier Express via Liechtenstein and its capital Vaduz. Even with cloudy skies and slight flurries, the scenery from the train was beautiful. We arrived in Zermatt in the early evening and checked into the Bristol. With a top elevation of 3,883m, this was the high point of the trip. The snow was in great shape and although we didn't get any new snow, plenty of fresh tracks were found with the help our guides Albi and Michael. Skiing Zermatt also meant heading over the top and skiing into Italy. Long descents into Valtournenche and Cervinia for lunch, expressos and wide empty groomers. A day with Michael was always an adventure. Whether it was roping up on a glacier tour or playing chicken with the train as we crossed the tracks, fresh snow was always the reward. The last couple of days the cold came in but that didn't dampen the YES spirit. With the skiing still good, powder was to be found off the Gant and Riffelberg areas. A couple of gems were discovered in the Blatten and the "Chicken Coop" where plenty of Gili Gili and gluwien were consumed. 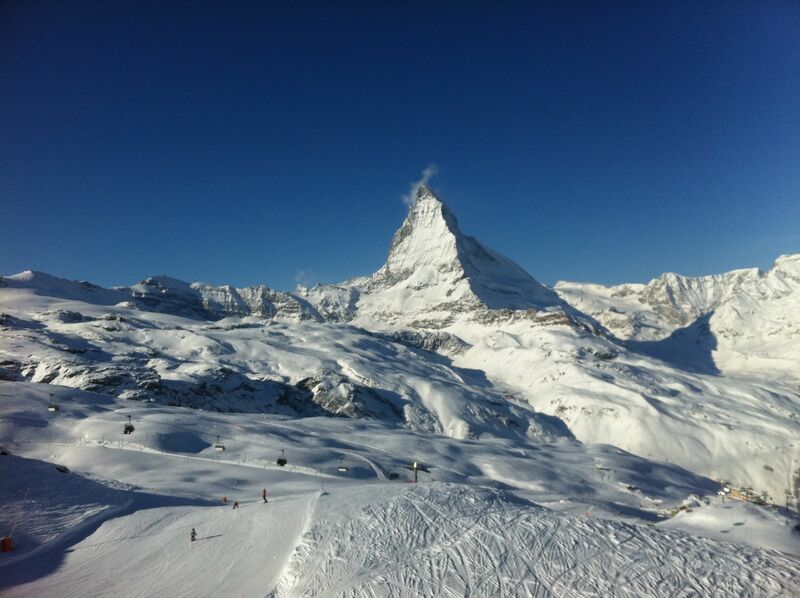 With the Matterhorn playing hide'n'seek all week, it came out to play on our final day, as did all the cameras. It was with tired legs and a tear in our eyes that we boarded the buses to Geneva, the temperatures absolutely arctic as the seawall around Lake Geneva was covered in ice. A final dinner was had and already stories about the trip were being told. With satisfied smiles, people headed off the next day, those going to Heathrow getting there eventually. With the buzz still going about this trip, plans for the next adventure are already being made. A big thank you to all who participated in this adventure and made it the great trip that is was. - Every bus driver commented on how much luggage we had. - No matter what country we were in, every time there was a slow sign, we had to keep as much speed as possible. - Howard's passport saw more of Europe than he did. - Cherin should change profession and become a geologist with all the rocks he uncovered. - When in powder, Megan should really look ahead and watch out for ditches. - Never get in a gondola with the Dingster unless you wish to witness a show that includes red tights. - Apparently Becs can ski in a parallel snowplow in the dark. - Paul can make it through a whole trip with all his equipment. - Rosi got on most of the right buses and mainly at the right time. - Grant likes to bounce off walls and should be a fisherman with his love for nets. - Erin played chicken with a train and won. - Mike's eye grew to size of saucers as he sunk into the powder and kept sinking. - Angela's laugh can cause avalanches. - For a Man who doesn't drink, Rob would always be the first to offer to buy you a beer. - Silvija, Leslie and Kim – the core of the "Hard-Core-Powder-Puffs – always needed that twist of the arm to stop for an après/during/pre beverage. - Chris proved that a single-planker could enjoy himself in the company of skiers. - One should be careful of boot dryers and custom liners. - Linda proved that is almost possible to shop as much as Rosi. - You can buy a gold-plated car. - Your poles can get stolen, even if left outside a church. - The Euro’s love to slam the safety bar down with no warning.